Bring deli-style slicing into your home with this 130W food slicing machine. It features a German precision blade for effortless slicing and you can select the thickness you want using its handy dial, which has settings up to 23mm. 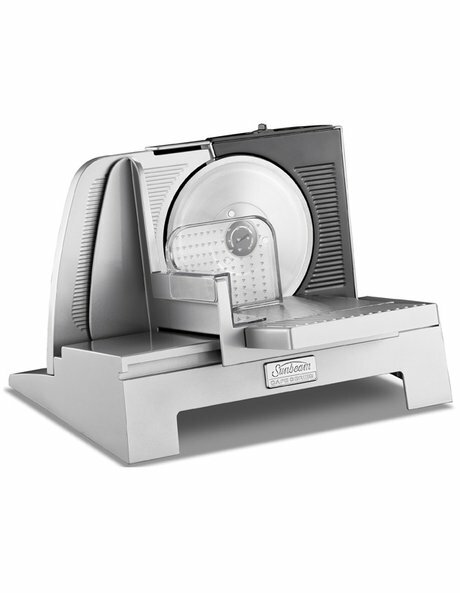 The Sunbeam Cafe Series Deli Food Slicer - White ES9600 can slice through meat, bread, cheese, fruit and vegetables, and its dual safety switch system enables you to ensure the food is held in place and your fingers are protected. Includes 1 year warranty. - Slices meat, bread, cheese, fruit and vegetables. - Adjustable thickness dial with settings from 0mm to 23mm. - Dual safety switch system. - Includes 1 year warranty.